Son of a convict transported to Van Diemen's Land in 1830, WC Piguenit was schooled in Hobart and later worked in the Department of Lands survey office as a draughtsman. He received rudimentary instruction in painting, however he was largely self taught, making sketching and photography trips to remote and spectacular regions of Tasmania. Piguenit painted in the colonial Romantic tradition, describing nature in terms of its infinite mystery combined with a topographical essence of its features. 'Mount Olympus' is one of many works in which Piguenit painted Tasmania in terms of a sublime majesty evoked through a masterful orchestration of earth, water and sky and dwarfed human activity. It was the first oil painting acquired by the Art Gallery of New South Wales. Signed and dated l.l., oil "W. C. Piguenit 1875". Barry Pearce, Australian art: in the Art Gallery of New South Wales , 'Introduction', pg. 10-16, Sydney, 2000, 12, 18, 35 (colour illus. ), 301. Barry Pearce, Charles Conder 1868-1909 , 'Between worlds: Conder in Australia', pg. 12-31, Sydney, 2003, 17. Barry Pearce, Art Gallery of New South Wales handbook , 'Australian', pg. 13-35, Sydney, 1988, 13 (colour illus.). Peter Quartermaine, Australian art and architecture: essays presented to Bernard Smith , 'Speaking to the eye: painting, photography and the Popular Illustrated Press in Australia 1850-1900', pg. 54-70, Melbourne, 1980, 68, 70. Daniel Thomas, Art and Australia , 'Australian collection', pg. 52-62, Sydney, Jul 1972, 52 (colour illus. ), 53. Illustrated Sydney News , Sydney, 06 Feb 1890, page unknown. Sydney mail and New South Wales advertiser , Sydney, 20 May 1875, page unknown. The Sydney Morning Herald , Sydney, 17 Apr 1875, page unknown. Mercury , Hobart, 17 Apr 1875, page unknown. The Sydney Morning Herald , Sydney, 15 Apr 1875, page unknown. The Sydney Morning Herald , Sydney, 12 Apr 1875, page unknown. The Sydney Morning Herald , Sydney, 03 Apr 1875, page unknown. The Sydney Morning Herald , Sydney, 29 Mar 1875, page unknown. Fourth Annual Exhibition of Works of Colonial Art 1875 , Sydney, 1875, 4. cat.no. 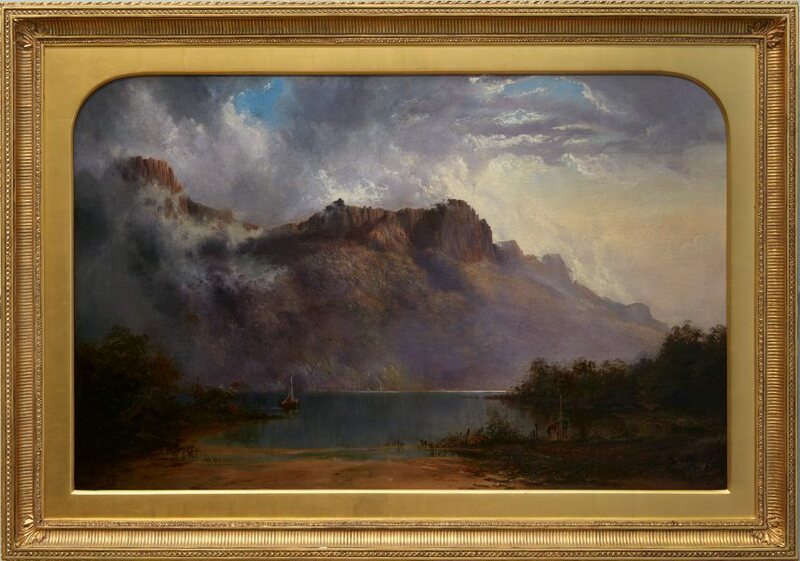 25; titled 'Mount Olympus, Lake St. Clair, Tasmania - the source of the Derwent'; painted by W.C. Piguenit; price 52.10.0. Fourth Annual Report of the New South Wales Academy of Art 1874-75 , Sydney, 1875, not paginated. listed in Appendix under 'Oil Paintings', Society's Extra Silver Medal (to Artist) No. 25 - W.C. Piguenit, artist, Tasmania; also mentioned in text. Art of Australia. Vol 1: Exploration to Federation , 'The mania and force of the stream', pg. 149-224, Sydney, 2008, 217 (colour illus. ), 218. Early painters of Australia, 1788-1880 , Sydney, 1988, 179, 181 (colour illus.). 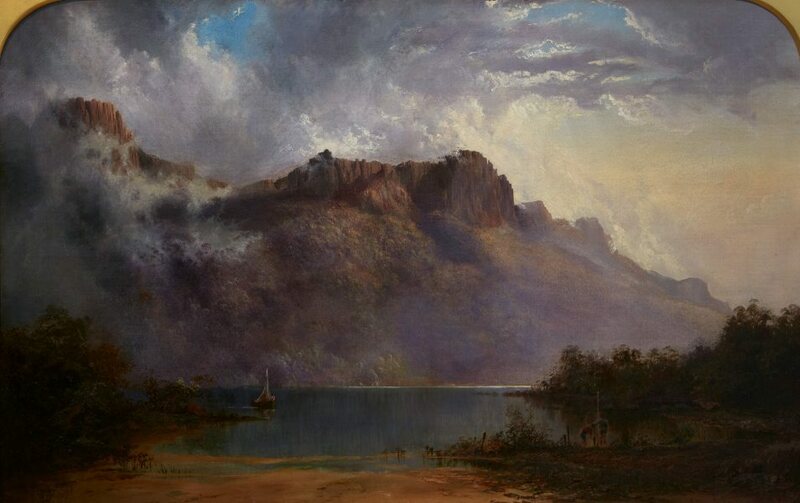 Images in opposition: Australian landscape painting 1801–1890 , 'The wilderness intact', pg. 81-86, Melbourne, 1985, 83, 84 (illus. ), 177. Portrait of a Gallery , 'Australian Art in the Old Courts', pg. 24-37, Sydney, 1984, 24.